Chances are some of you have driven an old clunker that had heating and air issues. Having no air conditioning is the lesser of two evils because you can simply roll the windows down to cool off. No heat, however, can be a major problem during the winter because you’re unable to defrost and heat your vehicle properly. For those of us accustomed to being in comfortable temperatures at all times, driving anywhere can be a miserable experience when the heat or air conditioning doesn’t work right. To better understand what could be causing your heat and air conditioning issues, let’s review how your auto’s HVAC unit works. Engine coolant (also commonly known as antifreeze) circulates through the heater core. 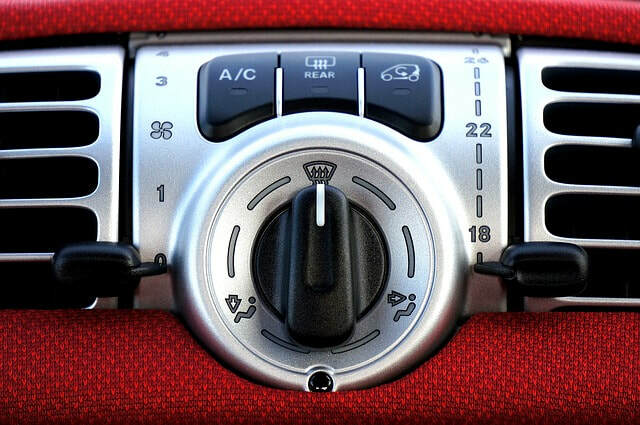 A fan blows cold air over the heater core which, in turn, heats the air before it travels through the vents and into the cabin of your vehicle. The process seems simple enough, so what could cause the heating to fail? Mainly, the issue arises from a corroded or clogged heater core. This leads to coolant leaks and, even, to the heat not working at all. If you notice a sweet chemical smell or the windows steaming up inside your vehicle, then you may have a coolant leak. The air conditioning system is a little more complex than the heating system. Refrigerant, or Freon, is in a gas state at room temperature. When you turn the A/C on in your car, it flows through the compressor and becomes hot. Next, the hot gas goes through a cooling process in the condenser which converts it to a liquid. The heated, (now) liquid refrigerant once again becomes a low-pressure gas after its journey through the expansion valve, and the evaporator cools it. The evaporator is akin to the heater core in that a fan blows air over it, and the cool air flows through the vents into the cab of your car. Since this is a complex system, there could be several reasons your air conditioner doesn’t work properly. It may need to be recharged with more refrigerant, but if that doesn’t help in the long run then you may have a leak. The leak will need to be patched or parts may require replacing.